Hello and welcome back to my blog! Today is special because it's basically a "these are a few of my favorite things" as I'm wearing 90% of my favorite brands! Members Only is my favorite jacket brand. Like, hands down! They're comfortable and perfect for moderate weather (or buildings with too much air conditioning blasting around!). I know I'm a California girl now, but it's been chillier here at night and that aforementioned air conditioning scenario happens daily, so these jackets have come in handy! I'm wearing the Washed Satin Boyfriend Jacket in burgundy (size small for reference) and I totally recommend it as it's silky to the touch. This jacket (and all other colors it comes in) are currently on sale for $65. I got this Trashy Diva Tropical Sangria skirt 3-4 years ago when I made my first ever Trashy Diva purchase. 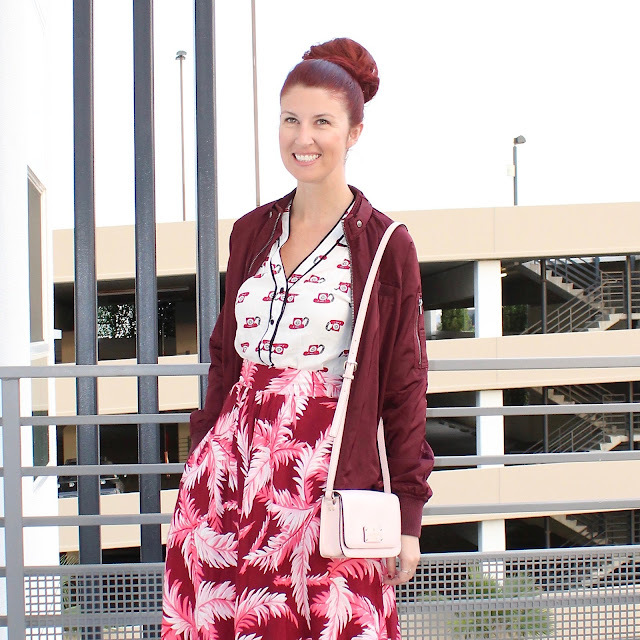 I love this skirt more than I ever thought I would (I was curious about how the burgundy and pinks would play out in person) and it's a huge staple of mine. 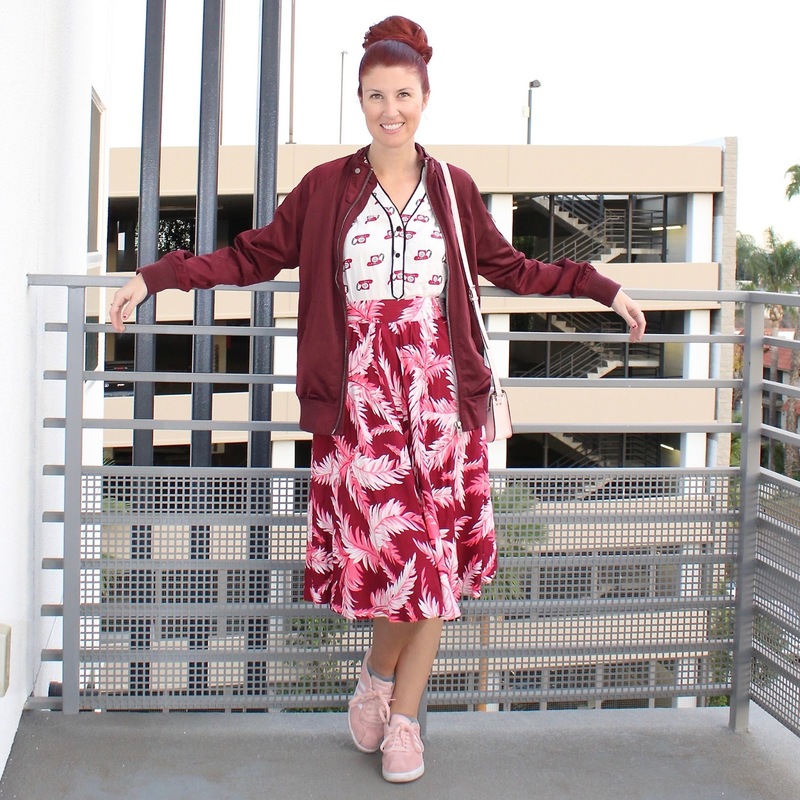 I paired the skirt this time with a ModCloth telephone print shirt as the phone is a reddish pink so I wanted to mix prints with these two pieces. (To better see the two prints mixed, scroll below for a photo.) 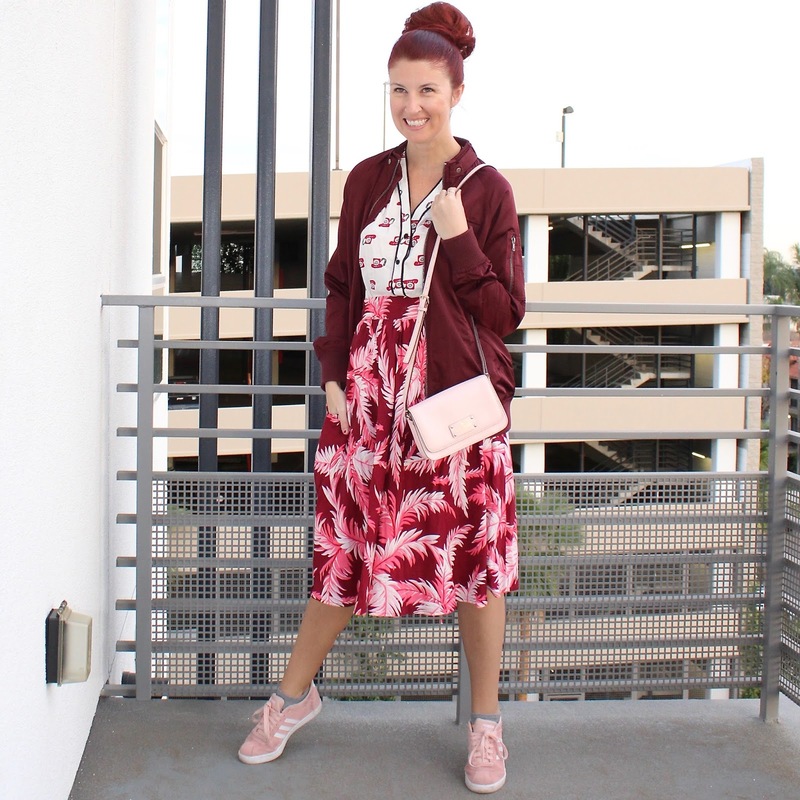 I kept the purse (Kate Spade) and the shoes (Adidas Courtset via DSW) in the theme of light pink to play off the pinks in the skirt and to break up the burgundy in the background of the skirt and the Members Only Jacket. How's everyone been doing the past week? Real talk: I'm borderline losing my mind! But in a fun way. I bit off more than I realized for January/February so I'm a little crazed. But all of this hard work and time commitments are in the name of comedy and chasing my dreams, so I mean none of this as a complaint and more as a reason I haven't been blogging as much. That all said, I've been catching up with getting outfit photos so I should be consistent again from here on out!